Making the most of your RTA? 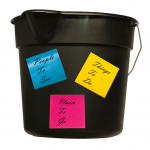 The term “Bucket List” was highlighted by the movie and symbolizes doing things you always wanted to do, before you kick the bucket. These are things we dream of doing “someday” without the urgency of knowing our personal judgment day is right around the corner. “I have been throwing the words “bucket list” around for a while but never really took these words seriously, kind of just for fun. I have been an avid motorcycle rider for 38 years, with a break of a few years in between, when the kids where born. My wife and kids started convincing me at the beginning of the year, like “hey you’re going to be 60 – do route 66. You have talked about it for so many years”. Then the organizing started, flights, renting the perfect bike for route 66; had to be a Harley Davidson Softail Heritage, of course. Then the day came to pick up the bike in Chicago, butterflies in my tummy. I started off, it was pouring down rain. I was sitting on the bike, wet as never before, with a big smile on my face and singing to myself. I had not realized how much this trip was doing for me; I loved every day. This was indeed a trip of a lifetime. I could go on for hours, but I will not. My message is if you have a dream, as I did for so many years, and you have the means to organize this, than get up, get your second wind and do it. His story prompted me to write several friends asking them what was on their bucket list. Their collective responses were much more than an imaginary journey. It was a great lesson in life, something we can all benefit from. Not one response dealt with “getting even” with anyone who had wronged them in the past. Instead the attitude was “get over it”, why let something bad from the past ruin the way you live the rest of your life. The overwhelming response was “Why wait?” Why does anyone need a looming judgment day to express feelings to family and friends? Express those feelings regularly. What happens if the other person dies before you get a chance to tell them how you feel? What a missed opportunity. Get these done now and keep it that way. Most everyone couched their response by sharing some of the many cool things they have enjoyed during their lifetime. While things still may be on their list, they did a lot of fun things and feel no regrets about those that remain. For years I wanted to see Elvis Presley live in concert. At the time I was raising a family and did not have the time or money. I never got it done. There is no point in fretting over it. I missed one but there are still plenty left to look forward to. “My great uncle was the captain of the Mary Celeste, one of the greatest sea mysteries ever. This ship, a brigantine, was found off the Azores in 1862 with no one on board. My wife Linda and I saw a similar brigantine sitting in a marina in St. Martin in 2006 named “Eye of the Wind”. I followed it over the years while it was in dry dock, and finally back in service as a training vessel and also available for charter. Places they visited ranged from the Azores to Zanzibar and everywhere in between. Grand Canyon, Hoover Dam, Elvis’ home, British castles, tropical paradises and Mt. Rushmore were common. I’ve done them all and highly recommend them. What are you going to do with your RTA? As my peer group transitioned from the work force to retirement we spent many hours discussing how to use our RTA (Remaining Time Available). What are your priorities? How do you want to spend your time? Putting together a bucket list is rearranging priorities. The dreams may have been prioritized as “maybe someday” and now move up the ladder to “why not?” Money and health might be a factor, do what you can. I’ve seen the Great Pyramids, and I can tell you driving to Grand Canyon was a lot more fun! Remember, no regrets. Hopefully your list will be exciting, challenging and fun, and encourage you to want to start planning the next one. Having your spouse check off an item on their list is like checking off one of your own; have fun together. 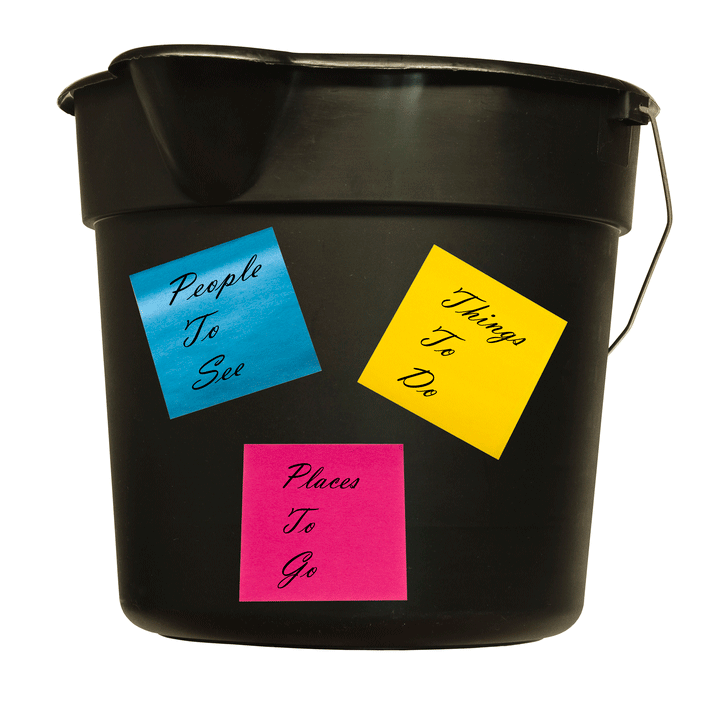 The movie, “Bucket List” was totally unrealistic. I resented the idea that a person has a bucket list and, after checking off the last item, it is time to die. The heck with that! Check one off the top and add another item to the list. One friend said, “I don’t want to die, while I am still alive!” Planning fun adventures, then enjoying them is what keeps us young. If you want to see what really happens when judgment day is imminent, watch the movie, “On the Beach”. While it is an excellent movie, with a great cast, there is nothing pretty, romantic or even exciting about the grim reaper knocking at your door. I doubt you would enjoy things quite so much when you are worried and preoccupied. When you are working you trade your time for money. When you retire, you trade money for time. Baby boomers have toiled 50 years or more to get to the age when they can quit working full time. Work within the framework of your budget, spend your time and money wisely and have some fun. Drive Route 66 if it is on your list. If there are things you always wanted to do, don’t ask “why” – ask “why not?” Scratch the itch that has been there for many years. Check it off and start on the next one. I want to thank the many friends who responded to my request for help with this subject, which is near and dear to my heart. One friend suggested I collect a large number of stories, two of which I shared in the column, and someday write a book. If anyone has a story to tell, please drop me a note at dennis@milleronthemoney.com. I would appreciate it. My file folder on this is getting bigger. Writing this type of book could easily move up to the top of my bucket list. Any and all help would be appreciated. I want to take a minute and encourage our readers to check out a couple of websites. Sandy Franks has a terrific site which my wife Jo just loves. TheWomensFinancialAlliance.com While she caters to the ladies, I will confess she has taught me a good deal with her publication. Sandy is a veteran and is really in tune with her readers. In addition, good friend Ed Steer has started his own site, EdSteerGoldandSilver.com He publishes daily and is a must read for me every morning. If you want to know what is not only going on in the metals market, but also markets all over the world, I suggest you check him out. He does a terrific job of culling information and putting into a daily which is easy to read, a time saver and keeps me up to date on things I need to know. Both Ed and Sandy are friends, straight shooters and tell it like it is. The first weekend of the college football season is now behind us. I had a friend who played football at a big name university. I used to tease him about scheduling patsies; particularly for their home opener. He told me the best opponent for a home opener is a school so small that his school has more kids in freshman English, than they have in the entire school. They look at it as a practice game. It gives a lot of kids a chance to play and get some experience before the tough conference schedule comes in to play. This week the “golden patsy” award goes to Ole Miss who beat Tennessee Martin 76-3. I was pleased to see that Northwestern beat Stanford who was a ranked opponent. Both schools have some pretty good academic standards so there are some true student-athletes around. Good friend Alex N. sent me a cute story about the innocent things children say that seems to fit into this week’s theme. Alex and his wife Cheryl are two of the busiest people I know. They are always on the go. He is recovering from hand surgery. Get well quick my friend; you still have a lot of things on your list to go.